On 10 June 1944, the village of Oradour-sur-Glane in Haute-Vienne in Nazi-occupied France was destroyed, when 642 of its inhabitants, including women and children, were massacred by a German Waffen-SS company. A new village was built nearby after the war, but French president Charles de Gaulle ordered the original maintained as a permanent memorial and museum. In February 1944, the 2nd SS Panzer Division "Das Reich" was stationed in the Southern French town of Valence-d'Agen, north of Toulouse, waiting to be resupplied with new equipment and fresh troops. Following the D-Day invasion of Normandy in June 1944, the division was ordered north to help stop the Allied advance. One of its units was the 4th SS Panzer Grenadier Regiment ("Der Führer"). Its staff included regimental commander SS-Standartenführer Sylvester Stadler, SS-Sturmbannführer Adolf Diekmann commanding the 1st Battalion and SS-Sturmbannführer Otto Weidinger, Stadler's designated successor who was with the regiment for familiarisation. Command passed to Weidinger on 14 June. Early on the morning of 10 June 1944, Diekmann informed Weidinger that he had been approached by two members of the Milice, a collaborator paramilitary force of the Vichy Regime. They claimed that a Waffen-SS officer was being held prisoner by the Resistance in Oradour-sur-Vayres, a nearby village. The captured officer was claimed to be SS-Sturmbannführer Helmut Kämpfe, commander of the 2nd SS Panzer Reconnaissance Battalion (also part of "Das Reich" division). He may have been captured by the Maquis du Limousin the day before. On 10 June, Diekmann's battalion sealed off Oradour-sur-Glane and ordered everyone within to assemble in the village square to have their identity papers examined. This included six non-residents who happened to be bicycling through the town when the SS unit arrived. The women and children were locked in the church, and the village was looted. The men were led to six barns and sheds, where machine guns were already in place. According to a survivor's account, the SS men then began shooting, aiming for their legs. When victims were unable to move, the SS men covered them with fuel and set the barns on fire. Only six men managed to escape. One of them was later seen walking down a road and was shot dead. In all, 190 Frenchmen died. The SS men next proceeded to the church and placed an incendiary device beside it. When it was ignited, women and children tried to escape through the doors and windows, only to be met with machine-gun fire. 247 women and 205 children died in the attack. The only survivor was 47-year-old Marguerite Rouffanche. She escaped through a rear sacristy window, followed by a young woman and child. All three were shot, two of them fatally. Rouffanche crawled to some pea bushes and remained hidden overnight until she was found and rescued the next morning. About twenty villagers had fled Oradour-sur-Glane as soon as the SS unit had appeared. That night, the village was partially razed. 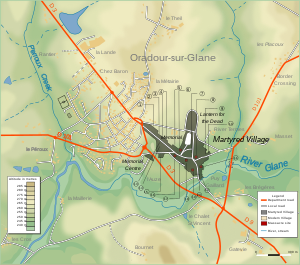 Several days later, the survivors were allowed to bury the 642 dead inhabitants of Oradour-sur-Glane who had been killed in just a few hours. Adolf Diekmann said the atrocity was in retaliation for the partisan activity in nearby Tulle and the kidnapping of an SS commander, Helmut Kämpfe. About 3 weeks ago, I saw a town within 4 hours bicycle ride up [sic] the Gerbeau farm [of Resistance leader Camille Gerbeau] where some 500 men, women, and children had been murdered by the Germans. I saw one baby who had been crucified. Murphy's report was made public in 2011 after a Freedom of Information Act request by his grandson, an attorney in the United States Department of Justice National Security Division. It is the only account to mention crucifying a baby. Shane Harris concludes the addendum is a true statement by Murphy and that the town, not named in Murphy's report, is very likely Oradour-sur-Glane. 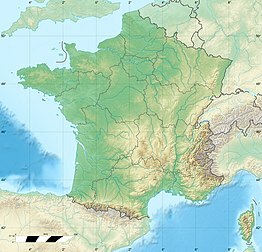 Protests at Diekmann's unilateral action followed, both from Field Marshal Erwin Rommel, General Gleiniger, German commander in Limoges, and the Vichy government. Even SS-Standartenführer Stadler felt Diekmann had far exceeded his orders and began an investigation. However, Diekmann was killed in action shortly afterwards during the Battle of Normandy, and many of the third company, which had conducted the massacre, were also killed in action. The investigation was then suspended. On 12 January 1953, a military tribunal in Bordeaux heard the charges against the surviving 65 of the 200 or so SS men who had been involved. Only 21 of them were present, as many were in East Germany, which would not permit their extradition. Seven of those charged were German citizens, but 14 were Alsatians, French nationals whose home region had been annexed by Germany in 1940. All but one of the Alsatians claimed to have been forced to join the Waffen-SS. Such forced conscripts from Alsace and Lorraine called themselves the malgré-nous, meaning "against our will". On 11 February, 20 defendants were found guilty. Continuing uproar in Alsace (including demands for autonomy) pressed the French parliament to pass an amnesty law for all the malgré-nous on 19 February. The convicted Alsatian former SS men were released shortly afterwards, which caused bitter protests in the Limousin region. By 1958, all of the German defendants had also been released. General Heinz Lammerding of the Das Reich division, who had given the orders for retaliation against the Resistance, died in 1971, following a successful entrepreneurial career. At the time of the trial, he lived in Düsseldorf, in the former British occupation zone of West Germany, and the French government never obtained his extradition from West Germany. The last trial of a Waffen-SS member who had been involved took place in 1983. Former SS-Obersturmführer Heinz Barth was tracked down in East Germany. Barth had participated in the Oradour-sur-Glane massacre as a platoon leader in the "Der Führer" regiment, commanding 45 SS men. He was one of several charged with giving orders to shoot 20 men in a garage. Barth was sentenced to life imprisonment by the First Senate of the City Court of Berlin. He was released from prison in the reunified Germany in 1997 and died in August 2007. On 8 January 2014, Werner Christukat, an 88-year-old former member of the 3rd Company of the 1st Battalion of the "Der Führer" SS regiment was charged, by the state court in Cologne, with 25 charges of murder and hundreds of counts of accessory to murder in connection with the massacre in Oradour-sur-Glane. The suspect, who was identified only as Werner C., had until 31 March 2014 to respond to the charges. If the case went to trial, it could have possibly been held in a juvenile court because the suspect was only 19 at the time it occurred. According to his attorney, Rainer Pohlen, the suspect acknowledged being at the village but denied being involved in any killings. On 9 December 2014, the court dropped the case, citing a lack of any witness statements or reliable documentary evidence able to disprove the suspect's contention that he was not a part of the massacre. After the war, General Charles de Gaulle decided the village should never be rebuilt, but would remain a memorial to the cruelty of the Nazi occupation. The new village of Oradour-sur-Glane (population 2,375 in 2012), northwest of the site of the massacre, was built after the war. The ruins of the original village remain as a memorial to the dead and to represent similar sites and events. On 6 June 2004, at the commemorative ceremony of the Normandy invasion in Caen, German chancellor Gerhard Schröder pledged that Germany would not forget the Nazi atrocities and specifically mentioned Oradour-sur-Glane. On 4 September 2013, German president Joachim Gauck and French president François Hollande visited the ghost village of Oradour-sur-Glane. A joint news conference broadcast by the two leaders followed their tour of the site. This was the first time a German president had come to the site of one of the biggest World War II massacres on French soil. On 28 April 2017, Emmanuel Macron, independent presidential candidate, visited Oradour-sur-Glane and met with the only remaining survivor of the massacre, Robert Hébras. Down this road, on a summer day in 1944 ... The soldiers came. Nobody lives here now. They stayed only a few hours. When they had gone, a community which had lived for a thousand years ... was dead. This is Oradour-sur-Glane, in France. The day the soldiers came, the people were gathered together. The men were taken to garages and barns, the women and children were led down this road ... and they were driven ... into this church. Here, they heard the firing as their men were shot. Then . . . they were killed too. A few weeks later, many of those who had done the killing were themselves dead, in battle. At the village of Oradour-sur-Glane, the day the soldiers came, they killed more than six hundred men, women ... and children. Remember. The massacre is referenced in the 2010 series World War II in Color in the episode "Overlord", which aired on 7 January 2010. It was also featured in part 2 of Hitler's Death Army, which aired on 27 November 2015, and showed both images from the time along with the ruins as they are today. The 1947 film White Cradle Inn tells the fictional story of one of Oradour's orphans after his evacuation to Switzerland. The 1963 Czech film Ikarie XB-1, which in some part inspired Stanley Kubrick making 2001: A Space Odyssey, has a scene where voyagers in the future, enroute to Alpha Centauri encounter a derelict ship from the past (1987). "The sequences on-board the Marie Celeste like earth ship from centuries before may seem like a plot tangent, but thematically its relevance is clear to see. Man of the 20th century lacked vision and faith and felt they had to take nuclear weapons, as well as a poison gas they called Tigger Fun, which was finally used on its own crew, preserving them from decomposition but killing almost instantaneously. Two of the Ikaria crew discuss them, with one referring to them as their ancestors, while the other declares them to be “human trash, that left Auschwitz, Oradour, Hiroshima behind them.”"
The 1975 French film Le vieux fusil, is based on these facts. The 2000 film The Patriot featured a scene where a church filled with civilians was burned by vengeful British troops during the American Revolution. In 2011, Time magazine published an article saying that this fictional event was based on events at Oradour-sur-Glane. A feature film, Une Vie avec Oradour, was released in September 2011 in France. In the 1947 Russian novel The Storm by Ilya Ehrenburg, which won the Stalin Prize that year, there is a fictionalized detailed description of the massacre (part vi, chapter a), citing the actual place and the actual SS unit responsible. The novel was published in English in 1948 by the Foreign Languages Publishing House in Moscow, and in 1949 by Gaer Associates of New York. In The Hanging Garden (1998) by Ian Rankin, Detective Inspector John Rebus investigates a suspected war criminal accused of leading the massacre of the fictional village of Villefranche d'Albarede, based on Oradour-sur-Glane. In the novel A High and Hidden Place (2005) by Michele Claire Lucas, a young woman who had escaped the massacre at age six and then was raised in a convent, begins to remember events of that day and come to grips with her hidden past. The poet Gillian Clarke, National Poet for Wales, commemorates the massacre at Oradour-sur-Glane in two poems from her 2009 collection A Recipe for Water, 'Oradour-sur-Glane' and 'Singer'. In 2015, Ethan Mordden published One Day in France, a short novel based on the events of 1944. Covering a twenty-four-hour period and moving back and forth between Oradour and nearby Limoges, the story fits invented characters into the historical record. In 2018, Michael Grant published Purple Hearts, the third and final novel in his "Front Lines" series. This series re-imagines the events of World War II as though women had been drafted into or allowed to enlist in the United States military, serving in combat positions along with men. The massacre at Oradour-sur-Glane is described from the perspective of a fictional American spy, who witnesses the events from a distance. In the Dark Horse Comics Grendel Tales miniseries "The Devil's Hammer", five Grendel knights massacre and horribly mutilate all but two of the inhabitants of a town named Oradour. In the video for The Streets' "The Escapist", Mike Skinner is briefly seen walking through the destroyed village of Oradour-sur-Glane. A photo of a wrecked car in the village (see below) is the basis of the cover of the album Tochka opory (Точка Опоры) by the Russian group Skafandr and Vasya V. from Kirpichi. ^ (in French) « Rubrique Valence d'Agen », Archives du Tarn-et-Garonne, 11 June 2011. ^ "Order of Battle for Das Reich as of June 1944". Oradour.info. 9 June 1944. Retrieved 24 November 2012. ^ Farmer, Sarah (1999). "Martyred Village". The New York Times (book review). ^ a b c d e Harris, Shane (5 June 2014). "The Massacre at Oradour-sur-Glane: An American lawyer finds new evidence about one of World War II's most notorious war crimes, seven decades after D-Day". Foreign Policy. ^ Smale, Alison (9 December 2014). "German Court Finds Lack of Proof Tying Ex-Soldier to Nazi Massacre". The New York Times. Retrieved 12 December 2014. ^ Smale, Alison. "In Germany, Former SS Man, 88, Charged With Wartime Mass Murder". The New York Times. Retrieved 10 January 2014. ^ Rising, David (8 January 2014). "88-Year-Old Charged in Nazi-Era Massacre". ABC News. Associated Press. Retrieved 11 January 2014. ^ Agence France-Presse (9 December 2014). "Court drops case against German over WWII French village massacre". Retrieved 9 December 2014. ^ a b Olivennes, Hannah. "German president visits site of Nazi massacre in France". France 24 International News. Retrieved 4 September 2013. ^ Morenne, Benoit (29 April 2017). "Le Pen Aide Is Fired Over Holocaust Comments". The New York Times. ^ "The Old Gun". 22 August 1975 – via www.imdb.com. ^ Taylor, Andrew (19 January 1998). "Tuesday's Book: The Hanging Garden by Ian Rankin (review)". The Independent. Retrieved 11 May 2016. ^ "Purple Hearts – Michael Grant – Hardcover". Fouché, Jean-Jacques. Massacre At Oradour: France, 1944; Coming To Grips With Terror, Northern Illinois University Press, 2004. Wikimedia Commons has media related to Oradour-sur-Glane.